Day 305: Tributes . . . So, who remembers Don McLean? Come on, everybody knows the song that made Don famous – American Pie (and no, we’re not talking “one time at band camp” American Pie). Don released several fantastic songs in 1971 – including both American Pie and Vincent. American Pie written around 1970 was a tribute to Chevy’s and Levy’s (and a verrry long song) – Vincent was a tribute to none other than Vincent Van Gogh. Like any classic, is a beautiful song and one that could be listened to over and over. You know, there are just some things that one can watch or listen to time after time after time! Tonight, while enjoying our Starry Night we watched The Rookie for like the umpteenth million time. Again, like all classics – it never gets old! And even though we know the dialogue and punch lines, we still blubber like idiots at the end – sad, but true. 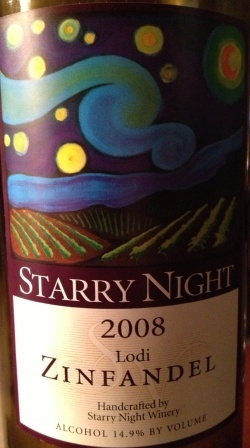 We digress, back to the wine – tonight we opened a 2008 Zinfandel from Starry Night Winery – appropriately named, Starry Night. The label itself is an eyeful – no doubt there is a connection to the song mentioned above. The colors and imagery are a dead giveaway! Not a bad little number. For the price (under $11) it wasn’t all that bad (not all that good mind you, but not all that bad). Per their website – This Lodi Zinfandel is made using traditional winemaking methods and is representative of the fine Zinfandels that have been grown in this appellation for over 100 years. This wine is well structured with fresh flavors of blackberries, cherries with hints pepper, spice and eucalyptus. Our Lodi Zinfandel can be paired with many dishes, but is especially good with pasta, steak, lamb, burgers and chocolate flavored breakfast cereal. Well, we pretty much agree with their description and admit that the wine was much better than we expected – might even make a runner-up position on the Bondy Deck Wine list. We like the wine, and while it was a bit thinner than we like our Zins – it had really nice structure and the palate and finish were pretty darn good. Not too sure about pairing with chocolate flavored breakfast cereal – but would agree that when paired with a nice steak would do really well. We enjoyed with one of Brian’s homemade pizzas – chocked full of freshness that included fresh basil from the plants on the deck . . . for the record, nothing better than home-grown basil! All in all – it was a great night for pizza and wine tonight at Casa del Vino. Have a SO (shout out) tonight – last evening we mentioned that D#1 got a wonderful job – well tonight we offer a toast to a super person we know affectionally as “Aunt Deb” – although no blood kin, we consider her family as part of ours. Many a good times were had with the gang on Huntington Circle in St. Charles, MO – – – no names mentioned, but you know who you are! Tonight Deb found out she was named as AD to a great Catholic High School – what a GREAT decision by school administration! We wish her well and know that she will add to the list of accomplishments at the school. – Congrats and best wishes! As we close down tonight, we also raise a toast to the 19 fire fighters who lost their lives battling a fire in AZ. You will be missed by family and friends – and praised by many. Thank you for your selfless dedication to a tough job – though we’ve never met . . . please know you are in our thoughts and prayers. Hugs those close to you tonight – tell ’em you love them . . . life is too short! As always, remember to enjoy responsibly and recycle whenever possible. Categories: Uncategorized | Tags: American Pie, Deb Westhues, Don McLean, Firefighters, Starry Night Winery, Starry Night Zinfandel | Permalink.